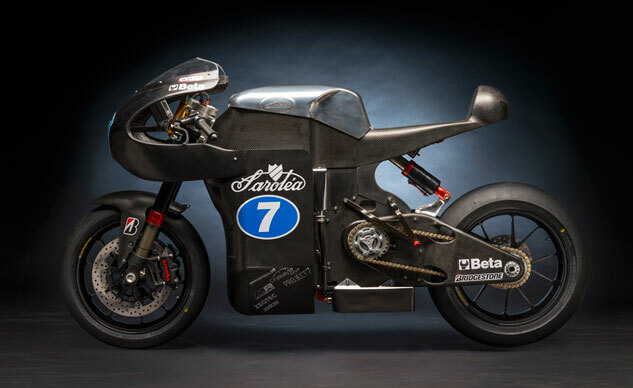 Belgium’s oldest motorcycle brand Saroléa is back with its new SP7 electric racebike that will compete in the Isle of Man‘s TT Zero race and the FIM‘s eRoadRacing World Cup. Saroléa has a long history dating back to 1850 when it was a weapons manufacturer. The company eventually shifted to producing bicycles and motorcycles, and had some motocross racing success in the ’50s but soon got folded into the Gillet Herstal company in 1963. Five decades later, the Saroléa name is back, now venturing into the electric motorcycle segment with the SP7. The Saroléa SP7 uses a axial flux motor wrapped in a carbon fiber monotube chassis. The powertrain was developed by Thijs De Ridder who raced his race-winning DR Motors electric bike in the 2010 FIM e-Power series. Suspension components are provided by WP while Brembo supplies the brake calipers. 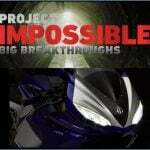 The forged Marchesini wheels are clad in tires from Bridgestone which is also a technical partner in the project. 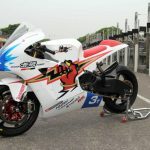 Saroléa has signed Robert Wilson to ride the SP7 in the TT Zero. The Scottish rider made his Isle of Man TT debut in 2011, recording five top-20 finishes in three years including a career-best 13th in the 2012 Supersport race. 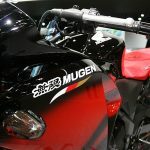 De Ridder will ride the SP7 in the eRoadRacing World Cup.